pencil boxes in our desks. A pencil case or pouch works better. Below you will find a list of materials that your 5th grade homeroom teacher has suggested you purchase for the 2018-2019 school year. It is our wish that you don’t spend unnecessarily. 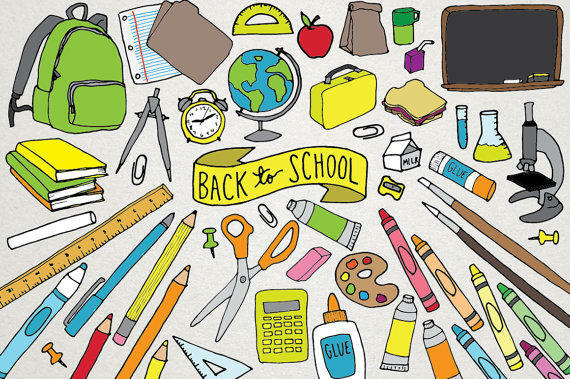 Most of these items can be purchased at Wal-Mart, Big Lots, Target, and/or a dollar store during the “Back to School” sales. If you have difficulty finding these items, or have problems with the cost, please just write the teacher a note in the beginning of the school year. This list is intended to make shopping easier, so that you won’t have to buy extra unneeded supplies. We look forward to working with you in the fall! Blue or Black pens - No red pens, colored pens, or gel pens! Two, 1 ½ or 2 inch Binders/Portfolios (NO Black) MUST HAVE METAL RINGS : suggestion is two different colors with your name and subject on the front (Science/Math & Social Studies/LA/Reading). Book bags cannot be carried from class to class. Do not purchase a large book bag with wheels. It will not fit in the locker. Welcome to the sixth grade at Woodruff School. We are excited for another successful year! As a sixth grade team we value the importance of organization, determination, and education while in sixth grade. Our goal is to create independent learners who have a value in their education. Through this transition we would like students to take pride in their work and organization and by the end of sixth grade needing less support by parent and teachers. Simple things like keeping your locker organized, writing homework in your agenda, and studying, can ensure a child’s success in the sixth grade. In this transition, they are developing life long skills of organization and self-determination. Please review the supply list and understand that we are looking for your child to be organized each and every day. With the addition of chrome books, we have now condensed the supply list.